Celebrate the season with delicious flavor, and check out this Fruit 'n Nut Drop Sugar Cookie Recipe. Chock-full of dates, walnuts and candied cherries, this delectable Fruit 'n Nut Drop Sugar Cookie Recipe is sure to become a holiday tradition. Preheat oven to 375°F. Beat cream cheese, butter and sugar in large bowl with electric mixer on medium speed until well blended. Add egg; mix well. Combine flour, baking soda and salt. Gradually add to cream cheese mixture, beating until well blended after each addition. Stir in dates, chopped walnuts and cherries. Drop rounded tablespoonfuls of dough, 2 inches apart, onto greased baking sheets. Top each with a walnut half. Bake 9 to 11 min. or until edges are lightly browned. Remove from baking sheets to wire racks. Cool completely. 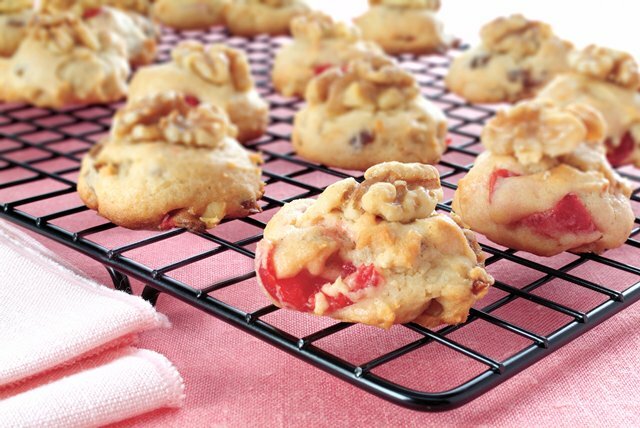 With their built-in portion control, these cookies make a great holiday treat!